In addition to acting as an anti-ageing agent, it strengthens the body's resistance to infectious diseases, increasing the oxygen capacity of the blood, and improving stress tolerance. Also, it improves the balance of blood pressure, blood sugar, and increase in oxygen and nutrients in your cells resulting in increased muscle strength, vitality and mental stability. Natural wavelengths of far infrared light, for example, are essential for bone growth as well as preventing osteoporosis, regulating hormonal functions and boosting your immune system. If using this product a long time to drink filtered water, not only can add to the body of zinc lithium, iodine, selenium and other trace elements in over 20, but also to regulate micro-organisms cycle, improve the body, immune capacity of health play a role. Development of new antibacterial, activation, adsorption, filtering water purification products. 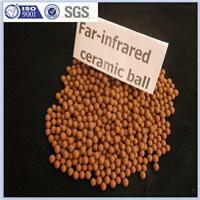 Preparation of materials from the far outside of the ceramic ball, the far-infrared emission rate is high and the water absorption, the goods will be fully rich in zinc, lithium, iodine, selenium and other essential more than 20 kinds of trace elements, slow evenly In the release of water purification, making the activation of water purification contain more useful minerals. For water purifiers, functional textile fiber, etc.